There is a strong relation between nanotechnology and miniaturized (bio)analytical or biosensing systems. The advantages of miniaturized (bio)systems stand on the reducing of the amount of sample and reagents, detection facility, minimal handling of hazardous materials and in parallel multiple sample detection. It is well known that nanomaterials (NMs) are bringing a series of advantages in the improvement of biosensing systems. DNA, proteins and even cells detection using electrochemical, optical and other techniques are gaining impressive advantages by using nanomaterials. 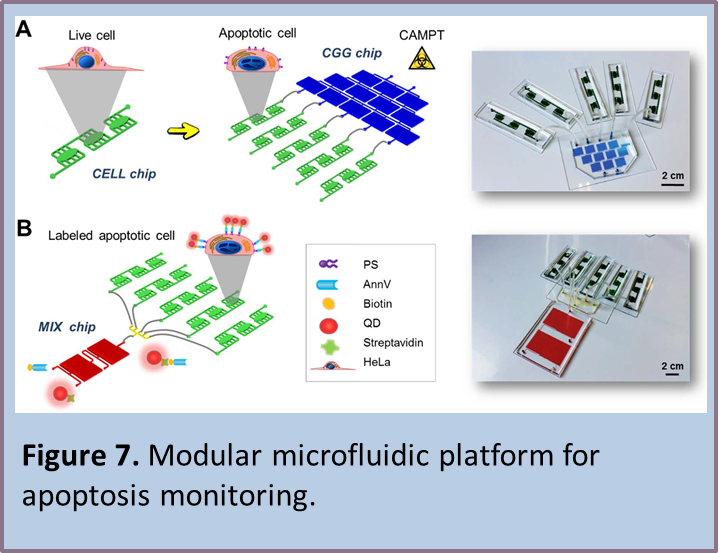 Given the advantages of NMs in the design of novel biosensing systems or improvements of the existing ones it is logical to see a strong interaction between these novel materials and lab on a chip (LOC) platforms. NMs are being used in microfluidic platforms as detectors (or detectors modifiers), tools for microreactors, and others. In addition LOC itself is being used for nanomaterials synthesis and characterization. The integration of NMs into LOC Systems seems to bring additional advantages in relation to the system sensitivity and miniaturization, besides the versatility of the designs and applications possibilities. This is a challenging field for future LOC biosensing technology as well as nano drug delivery platforms. Nevertheless problems such as the application of complicated fabrication and measuring technologies not suitable for mass production and user-friendly technologies need to be designed in order to bring these devices to the end-users. Amplification strategies to achieve low detection limits for Quantum Dots (QD) detection, with interest for their use as labels in biosensing technologies, are being considered for in-chip measurements. QDs have been reported as promising probes for ultrasensitive in-chip detection of biological targets, such as cancer biomarkers, among others using mainly optical techniques due to their high quantum yields, and easy and diverse surface modification flexibility . The use of QDs in biosensing applications has emerged as a very promising alternative for various optical or electrochemical sensing strategies. Of special interest has been the consideration of QDs bioconjugates as alternative to isotopes or organic dyes. The high sensitivity, selectivity, and low detection limits of electrochemical analysis of QDs already demonstrated in batch techniques would be of great interest if applied to a low-cost microfluidic device. According to that a hybrid polydimethylsiloxane /Polycarbonate (PDMS-PC) microfluidic platform with an integrated screen-printed electrode (SPE) is already developed  (Figure 1). This is an easy to be fabricated and low cost platform for QDs detection. Carbon (working and counter) and silver electrodes were printed by screen-printing technology onto a polycarbonate substrate. A slab of PDMS with a simple channel was bonded on it without showing any leakage. In order to evaluate the performance of the developed chip, cadmium sulphide (CdS) QDs were prepared and used for square wave anodic stripping voltammetry (SWASV) measurements. In addition, the design of a recycling system with the aim of achieving lower detection limits using reduced volumes of sample (25 µL) was proposed as a proof-of-concept. 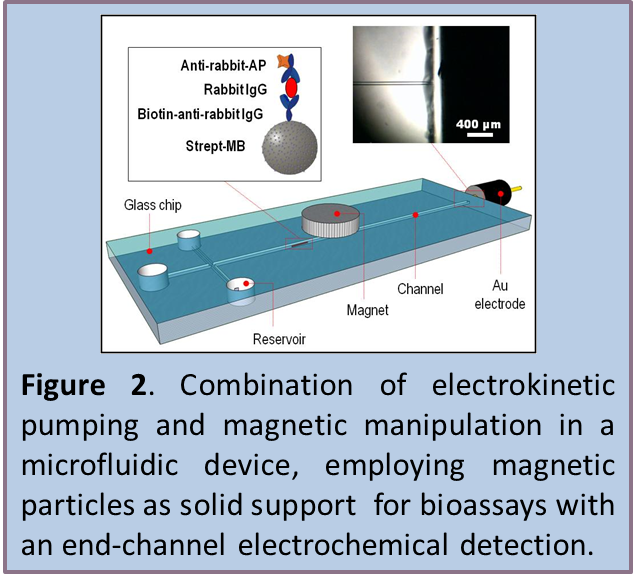 The combination of electrokinetic pumping and magnetic manipulation in a microfluidic device, employing magnetic particles as solid support for bioassays with an end-channel electrochemical detection is already developed  (Figure 2). Electrochemical detection is used as extremely sensitive technique to quantify the electroactive enzyme product generated within the channel. Widely used enzyme-linked immunoassays (ELISA) for the quantification of protein, are based on the optical measurement of the product of the reaction between an enzyme detecting label and a specific substrate. We propose an alternative detection format, performing the heterogeneous immunoassay onto paramagnetic particles, and detecting the enzyme product by means of amperometric technique. The proposed analytical tool showed promising performances carefully compared to optical detecting systems and offered additional interesting features, such as the possibility for multianalysis set-up, miniaturization, automation and also a high grade of versatility, since the detecting scheme could be easily adopted for protein analysis as well as for DNA analysis, cell counting and environmental control. Using LOC where magnetoimmunoassay is performed is possible to detect a number of important biomarkers. We designed and optimized microlfuidic chip for ApoE (Apolipoprotein E, known as an Alzheimer disease biomarker)  (Figure 3). We have also taken advantage of the use of bismuth for the enhanced detection of CdSe@ZnS QDs tags for the determination of human IgG as model protein  (Figure 4). 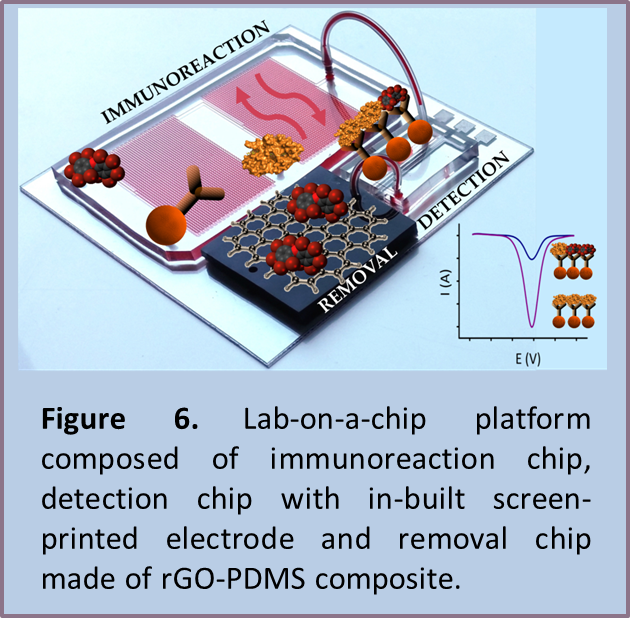 We have developed a multifunctional Lab-on-a-chip platform that combine such operations like immunoassay performance, electrochemical detection and graphene-based removal. As a model compound we evaluated PBDE (polybrominated diphenyl ethers) which still lack simple and sensitivity method for its determination. Due to the toxicity of PBDE we proposed the use of novel composite made of PDMS and reduced graphene oxide (rGO-PDMS). This composite can be used for LOC devices fabrication as well as any other materials but it´s characterized by a very strong adsorptive properties of any compounds containing aromatic rings (due to π- π stacking with rGO molecules). We proved the compatibility of this platform (both immunoassay and removal) with real samples such as seawater  (Figure 6). 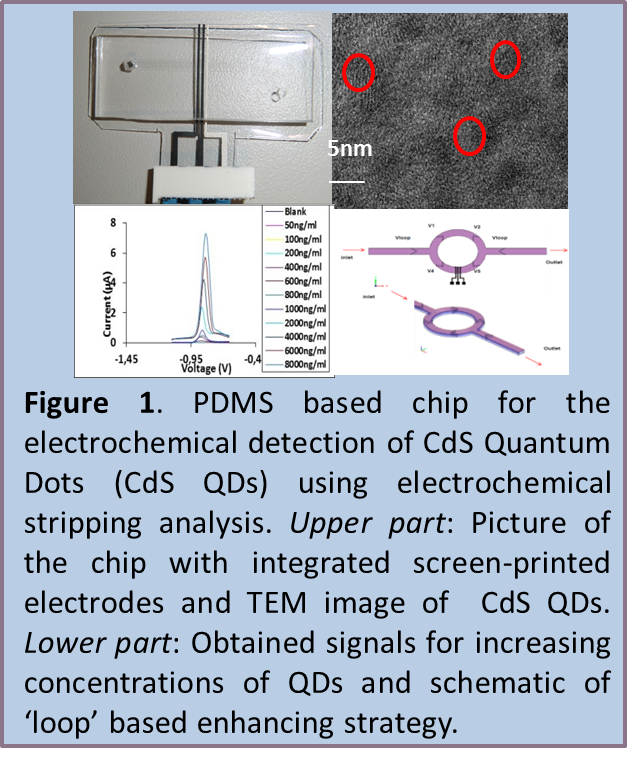 1) Mariana Medina-Sánchez, Sandrine Miserere, Sergio Marín, Gemma Aragay, Arben Merkoçi, “On-chip electrochemical detection of CdS quantum dots using normal and multiple recycling flow through modes”, Lab Chip, 12, 2012, 2000–2005. 2) Adriano Ambrosi, Maria Guix, Arben Merkoçi, “Magnetic and electrokinetic manipulations on a microchip device for bead-based immunosensing applications”, Electrophoresis, 32 (8), 2011, 861-869. 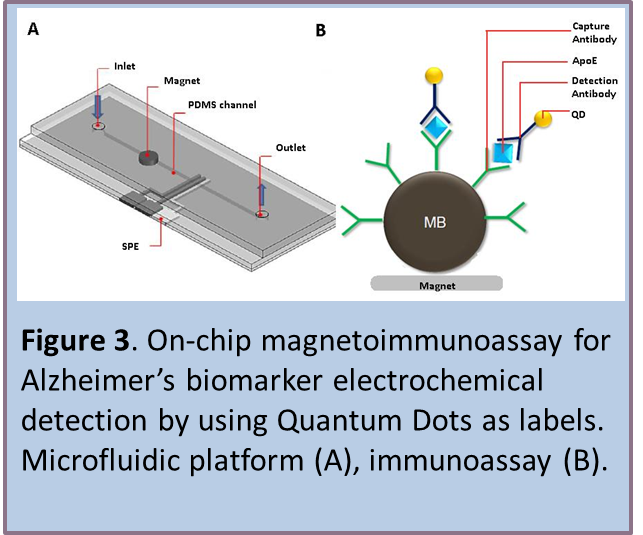 3) Mariana Medina-Sánchez, Sandrine Miserere, Eden Morales-Nárvaez, Arben Merkoçi, “On-chip magneto-immunoassay for Alzheimer’s biomarker electrochemical detection by using Quantum Dots as labels”, Biosensors and Bioelectronics 54, 2014, 279–284. 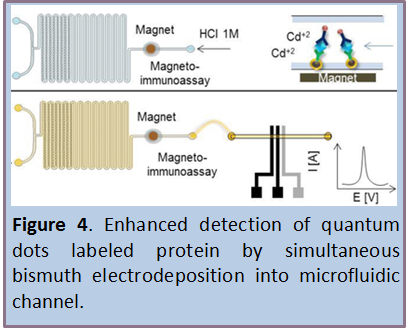 4) Mariana Medina-Sánchez, Sandrine Miserere, Miquel Cadevall, Arben Merkoçi, “Enhanced detection of quantum dots labeled protein by simultaneous bismuth electrodeposition into microﬂuidic channel“, Electrophoresis, 37 (3), 2016, 432–437. 5) Carmen C. Mayorga-Martinez, Lenka Hlavata, Sandrine Miserere, Adaris López-Marzo, Jan Labuda, Josefina Pons, Arben Merkoçi, “An integrated phenol ‘sensoremoval’ microfluidic nanostructured platform”, Biosensors and Bioelectronics 55, 2014, 355–359. 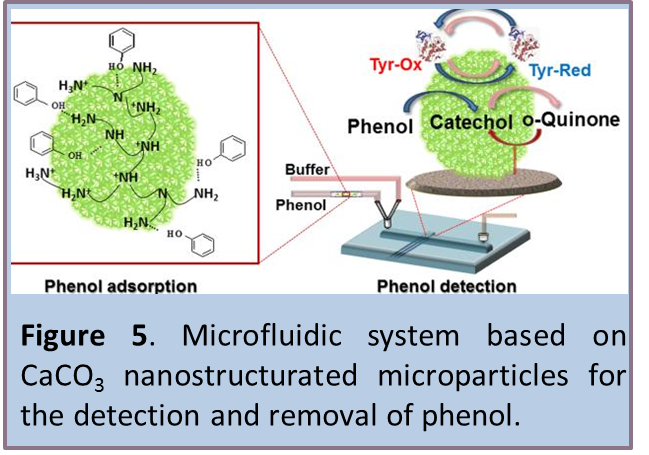 6) Carmen C. Mayorga-Martinez, Lenka Hlavata, Sandrine Miserere, Adaris López- Marzo, Jan Labuda, Josefina Pons and Arben Merkoçi, “Nanostructured CaCO3-PEI microparticles for phenol sensing in fluidic microsystem”, Electrophoresis, 34 (14), 2013, 2011–2016. 7) Andrzej Chałupniak and Arben Merkoçi , “Toward integrated detection and graphene-based removal of contaminants in a lab-on-a-chip platform”, Nano Research 2017, 01 March 2017, doi:10.1007/s12274-016-1420-3. 8) Mariana Medina-Sánchez, Carmen C. Mayorga-Martinez , Takeshi Watanabe , Tribidasari A. Ivandini, Yuki Honda, Flavio Pino , Kazuya Nakata, Akira Fujishima, Yasuaki Einaga , Arben Merkoçi, Microfluidic platform for environmental contaminants sensing and degradation based on boron-doped diamond electrodes, 75 (2016) 365–374. 9) Helena Montóna, Mariana Medina-Sáncheza, Joan Antoni Solera, Andrzej Chałupniaka, Carme Noguésb, Arben Merkoçi, Rapid on-chip apoptosis assay on human carcinoma cells based on annexinV/quantum dot probes, 94 (2017) 408–414.